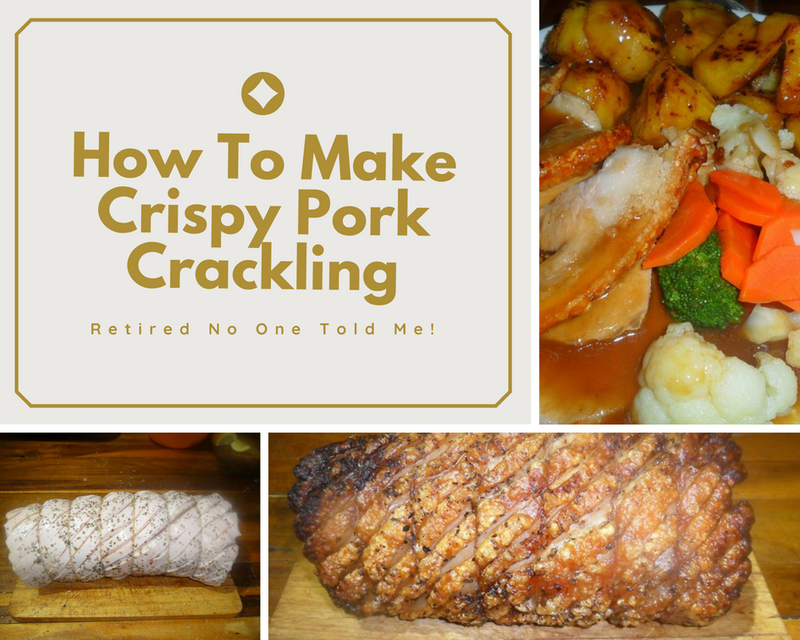 Pork Crackling | Retired? No one told me! Bacon contains nitrates which some people have an aversion to using or it causes headaches and other adverse symptoms. Today I am using celery juice..just put the celery into the juicer and out the other side and viola this lovely vibrant green juice. Now celery also contains nitrates but they are naturally occurring nitrates although for some people it may still cause headaches but if your aversion is to chemicals only then celery may be a better way to cure your bacon. Place Pork in a sealed container or bag ( I used a brining bag). Turn halfway through the week. That is why I like using the brining bags as it is much easier to turn the pork belly over. Cook in the oven @ 100 C for 2 hours. Cool and slice. 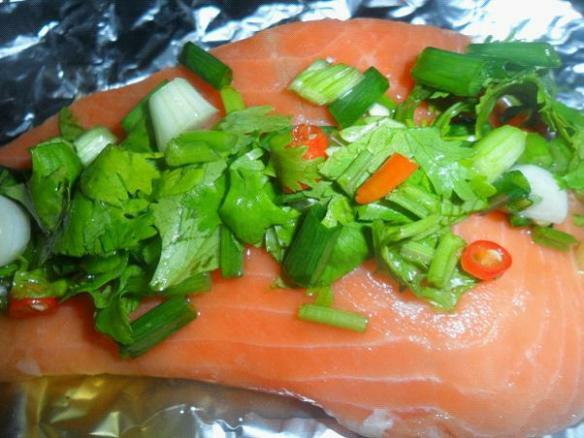 It smells like bacon, looks like bacon and made a lovely sandwich…. Most households have some who love thick bacon and some who like thinner bacon the beauty of making your own bacon is everyone can have their bacon sliced to their own requirements …How cool is that? My next two ham recipes are using Salt Petre I made the conscious decision that for the amount used and the dilution per litre of liquid that as the body can cope and disperse with the nitrate I would use that rather than getting botulism which the body generally doesn’t cope with. Also for the number of times, I make ham we are not eating it day in day out week after week the risk is minimal and considering the number of chemicals which are in foods by cooking my own food from scratch I have control. That is my decision. It is also extremely likely if you buy your ham ready to cook that nitrates have been used in the curing process I believe I use far less than any ham I buy ready to cook. Now mix the brine in a pot and cook up and cook for 10 min. Remove the pot from the heat. Remove the foam when it stops bubbling and leave the liquid to cool and save in a cold place. I put it in the fridge. Warning: Wear gloves even when dry rubbing. Clever clogs here didn’t the first time and I had a skin reaction all my own fault. When the ham is cured use your favourite recipe to cook and voila a lovely ham. I have cooked mine all ways usually I cover with water, bring it to the boil and then drain off all the water. Add fresh water and all my spices…I add a couple of bay leaves, cinnamon stick, mustard seeds, coriander seeds, about 3/4 cloves, a star anise and maybe a cardamom pod also about 2 tbsp of brown sugar…I cook for 20 mins per 500 gm of meat and then allow to cool overnight in the cooking water it is then ready to eat. 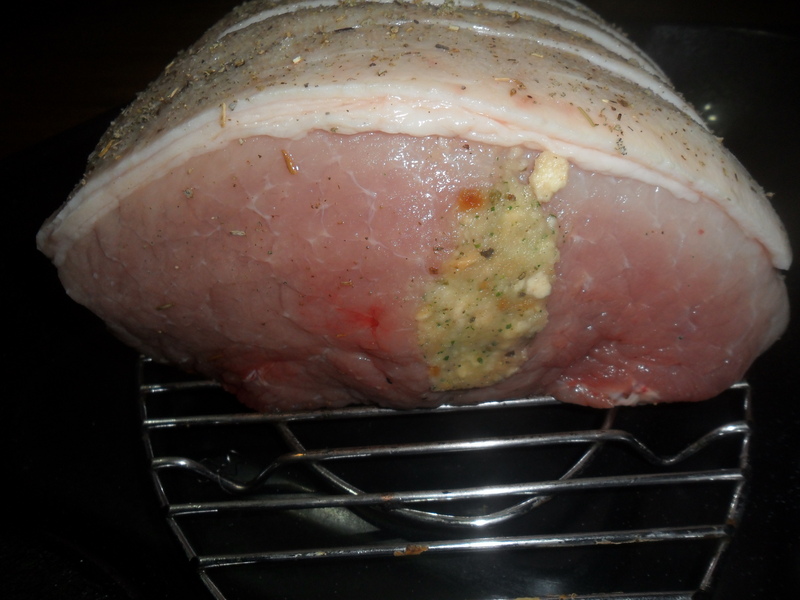 My third way of making ham which I did last Christmas was to use loin of pork instead of the leg. It is also much quicker to brine than a whole leg and only takes between 4-6 days depending on the size of your meat and how salty you like your ham. I used 2 kilos of Pork Loin. Mix the ingredients for the rub together and rub over the pork loin. Let the ham brine for 4-6 days. Tip: The first time I used loin I left it for 4 days the second time I left it for 5 days which suited our taste… It is always wise to do a test run I think as personal tastes vary. If I am making crackling ham I buy pork with the skin on and score the fat….when I get to the boiling stage I added water to just below the fat and then when it was cooked I covered the meat with foil leaving just the fat exposed then oiled and salted the fat put it in a high oven to crisp of the crackling…It went down a storm everyone loved it…A bit more work but crispy crackling with your ham…Awesome! 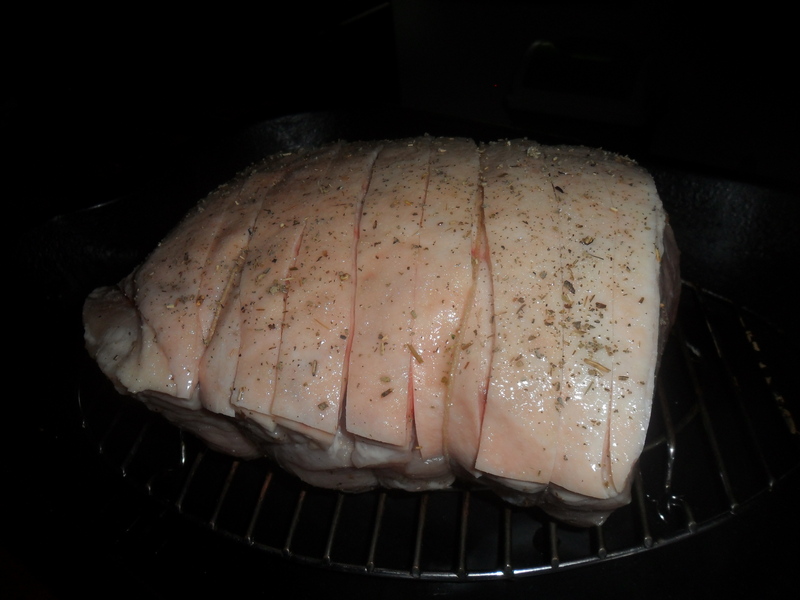 Most of the time I but my pork loin without the fat…When curing ham or bacon the meat must be fresh and not frozen. This entry was posted in Bacon, Christmas, christmas recipes, Cooking from scratch, Home cured Bacon, home cured ham, Uncategorized and tagged Celery juice, Christmas Ham, Cinnamon, Home cured Bacon, home cured ham, Made from Scratch, Pork Crackling, Spices on December 4, 2018 by CarolCooks2. You don’t have to live forever, you just have to live! Merry Christmas!….only 9 days to go….are you all busy braving the hordes of shoppers this weekend…or arm chair shopping..i’m a bit of both……We have been busy ..still putting up Decorations and tree looks lovely…. but no snow…….I am in a reflective mood as I think we should all remember those less fortunate than ourselves or those alone or recently bereaved as we get into the swing of the festivities….I miss my dad..especially at Christmas. 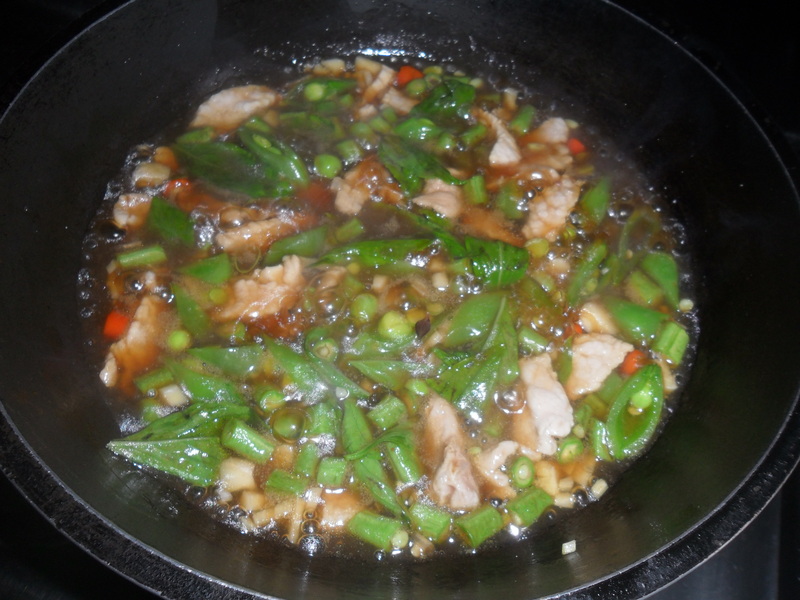 …My favorite Pork & Basil ( Moo Pad Horapa)…I must cook this at least 3/4 times a week…I have it for breakfast ,lunch or dinner and that is another thing I love about Thailand you eat what you fancy and when …no set breakfast dishes, or any meal…just what you fancy. 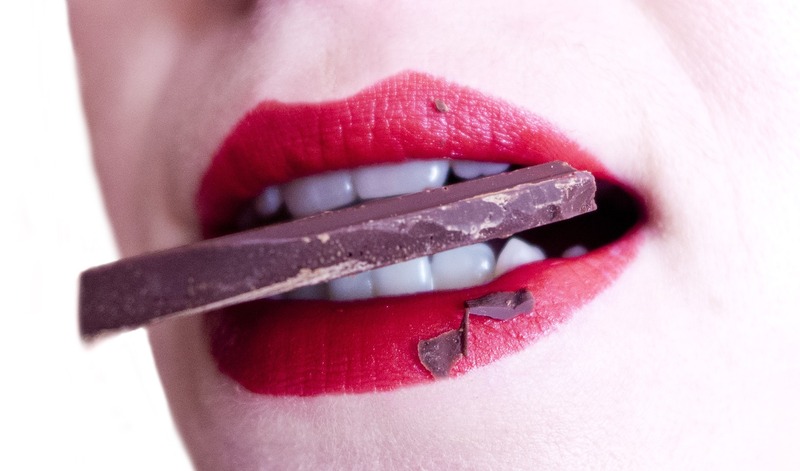 …Recipe next week…. 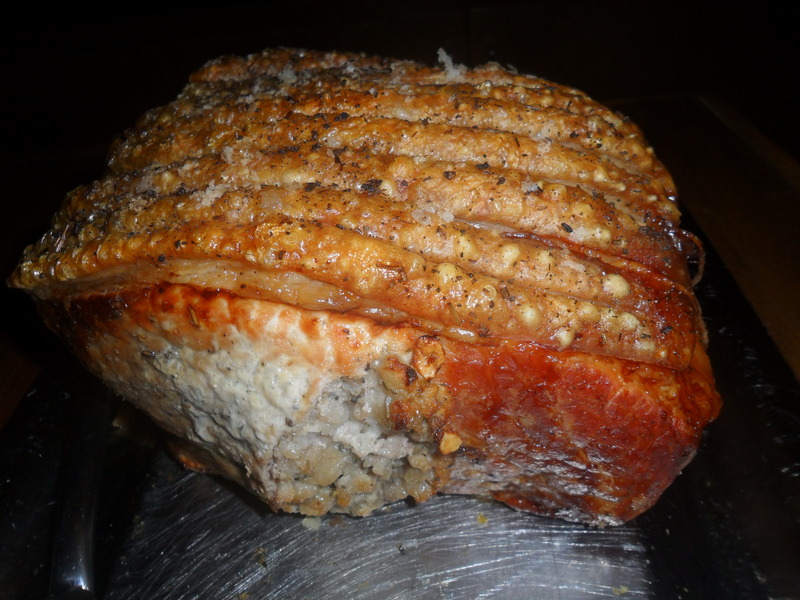 Early morning trip to the market 6.30 am…..lovely Pork Roast today…..cooked by my son…well he does cook most days… every week…my friends ask if I can hire him out…lol..and love it when they get an invite as his Pork Crackling ” Is the nuts” his phrasing not mine..ha ha…So just because I can…ha ha…. Well no sun today…..just very overcast….no rain yet….. Tomorrow I think I will get all my Christmas cloths etc out and plan my table and might do a trial run of Mince Pies….the mince meat has been fermenting,brewing whatever for a few months now so I think a taste testing is in order and just the smell of them cooking may make me feel a little more Christmassy..it’s definately the cold and SNOW…that makes that Christmas feeling and atmosphere…you all so know that until Christmas is over I’m gonna keep harping on about snow and cold ….going back to the UK @ the end September for my nieces wedding…first visit in 4 years so think I may stretch it out for a few weeks so I can soak up some Christmas Cheer and do some shopping…proper size wrapping paper for one ! Yay…. Just look at that lovely crackling! 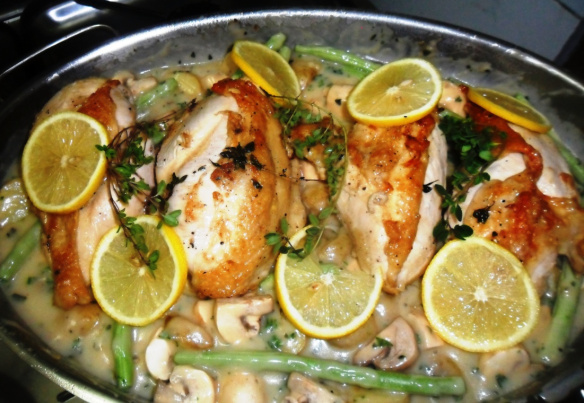 I will say my son is a brilliant chef and I will be his Sous chef any day…….Tastes amazing…just saying…sorry peeps if you lived closer I would invite you to taste test…ha ha…. Once Christmas is over then it won’t be long until my oldest son comes over with his 3 kids and we haven’t seen the kids since we came to Thailand and it is their first visit here so will be busy planning some trips…methinks Big Buddha will be a good one as they can see the Elephants( Chang) and experience some great Thai food and a beautiful view..maybe hire a quad to scoot through the jungle on or an elephant trek. Tchau…any guesses?…..no?……it’s goodbye in Portuguese. 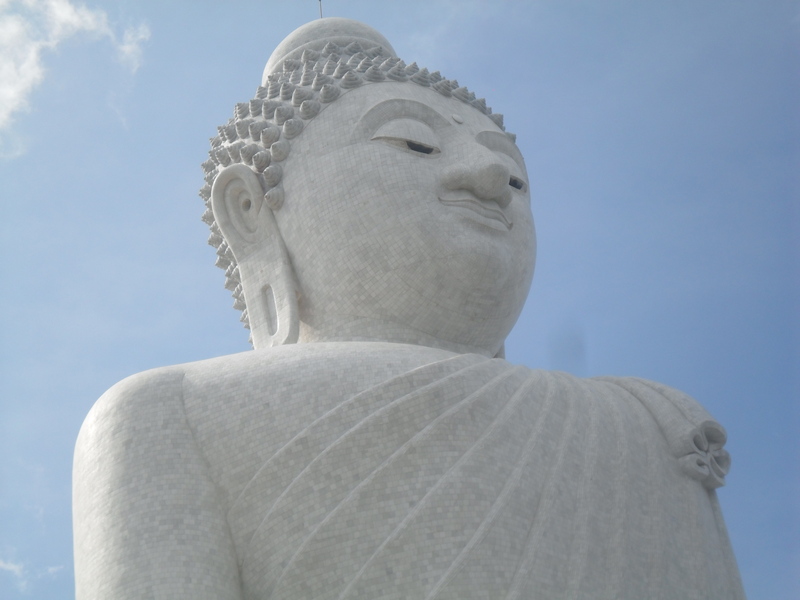 This entry was posted in A Taste of Thailand, Authentic Thai Food, Authentic Thai Recipes, Big Buddha, Christmas, Crafts, Life style, musings, Recipes, Retired! 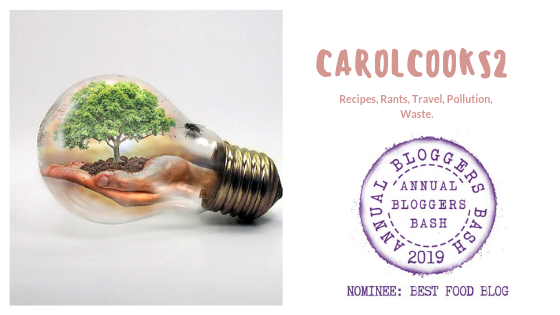 No one told me!, Retirement, Roast Pork, Thailand and tagged Christmas, garlic, Horapa Moo, My dad, Oyster Sauce, Pork Crackling, Thai Basil on December 14, 2014 by CarolCooks2.